Episode 008 – on canola oil, tips for travel, etc. In episode 8, I’m addressing some of your nutrition/wellness questions. Specifically, I respond to your questions about canola oil, tips for staying healthy while traveling, and whether or not to take a probiotic supplement for immune health. I finish up the episode by talking about mindset during the Christmas season. » I like to recommend using whole foods whenever possible and sticking with the less processed, unrefined, traditionally-based oils when needed. » Something I’m really going to focus on over the next month of advent is really slowing down. Really allowing my mind to center on the purpose of this Christmas season which is to celebrate the coming of the Savior of the world. Really guarding against the devil who is so good at making this time about stuff and consumerism. Also, please hop on over to your podcast platform (find linked just below), give the podcast a 5-star rating and share with others how you are enjoying the conversations.You can also do that by sharing this episode with someone you know who would be interested in joining the community. 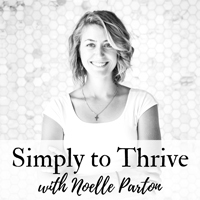 I so appreciate it and will also help others just like you who are wanting to connect nutrition and wellness to their faith to find the Simply to Thrive podcast.